One problem when dealing with developer “secrets” in development is accidentally checking them into source control. These secrets could be connection strings to dev resources, user IDs, product keys, etc. To help prevent this from accidentally happening, the secrets can be stored outside of the project tree/source control repository. This means that when the code is checked in, there will be no secrets in the repository. Each developer will have their secrets stored outside of the project code. When the app is run, these secrets can be retrieved at runtime from outside the project structure. One way to accomplish this in ASP.NET Core projects is to make use of the Microsoft.Extensions.SecretManager.Tools NuGet package to allow use of the command line tool. (also if you are targeting .NET Core 1.x , install the Microsoft.Extensions.Configuration.UserSecrets NuGet package). 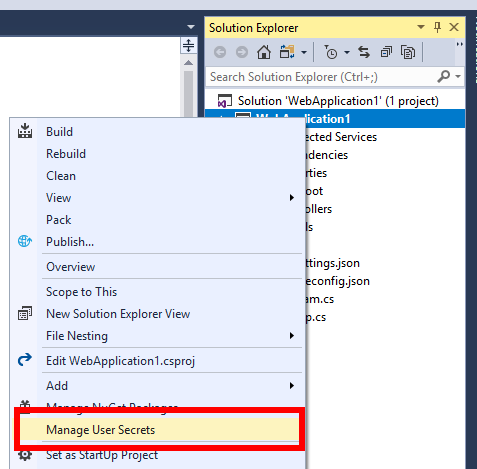 Clicking menu item will open a secrets.json file and also add an element named UserSecretsId to the project file. The content of this element is a GUID, the GUID is arbitrary but should be unique for each and every project. User secrets will be stored in the secrets.json file which will be in %APPDATA%\Microsoft\UserSecrets\<user_secrets_id>\secrets.json on Windows or ~/.microsoft/usersecrets/<user_secrets_id>/secrets.json on Linux and macOS. Notice these paths contain the user_secrets_id that matches the GUID in the project file. In this way each project has a separate set of user secrets. The secrets.json file contains key value pairs. User secrets can be added by editing the json file or by using the command line (from the project directory). To set (add) a secret: dotnet user-secrets set "Id" "42"
There’s a lot more information in the documentation and if you plan to use this tool you should read through it. This means that some brittleness can be introduced into the application, for example if the name of the controller or action is changed these strings can become outdated and cause a runtime error. The nameof operator introduced in C# 6.0 gets the (non fully qualified) name of the type passed to it. So for example nameof(HomeController) will return the string “HomeController”. The nameof operator can also be used with type members, for example nameof(HomeController.Index) will return the string “Index”. Now if the name of the HomeController.Index method is renamed, for example to HomeController.Index2, there will be a build time error: “'HomeController' does not contain a definition for 'Index'”. The preceding code however causes errors, the link URL produced is “http://localhost:26663/HomeController/About” rather than the correct “http://localhost:26663/Home/About” (note the extra Controller text). In the preceding example, nameof(HomeController.Contact) will return the string “Contact” and the URL “http://localhost:26663/Home/Contact” wheras the correct URL should be “http://localhost:26663/Home/Contact2” because of the [ActionName("Contact2")] attribute. Note that to get access to nameof, the view needs to be compiled with C# 6.0 language features enabled. I’m currently working on an AutoFixture Pluralsight course and it got me thinking about using it to generate anonymous test data when writing automated UI tests. The basic premise is that in addition to using AutoFixture to generate unit test data, it can also be used to populate UI elements where the specific data values are unimportant. If you are unfamiliar with BDDfy and Seleno, they are part of the TestStack project. BDDfy allows tests to be written and to produce business readable documentation. Seleno allows the automation of web browsers using Selenium and strongly-typed page object models. 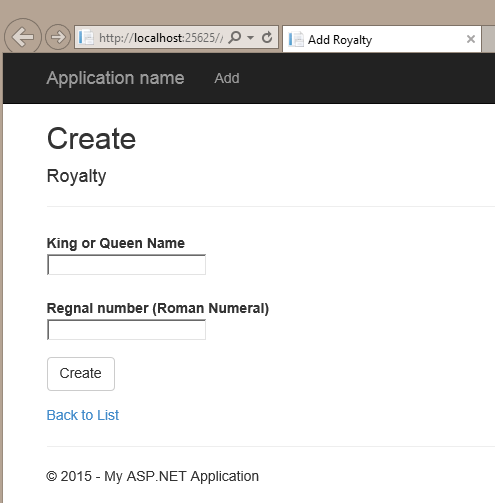 Imagine that we have an (ASP.NET MVC) web site that allows the addition of members of the royal family. Notice in the preceding code that even though we don’t care about the Regnal number we are still supplying it in the examples. We could just set it manually to a hardcoded value, and in this simple example that might be ok, but if we had a form with many fields then this will introduce extra work and may make the test less “refactor-safe”. 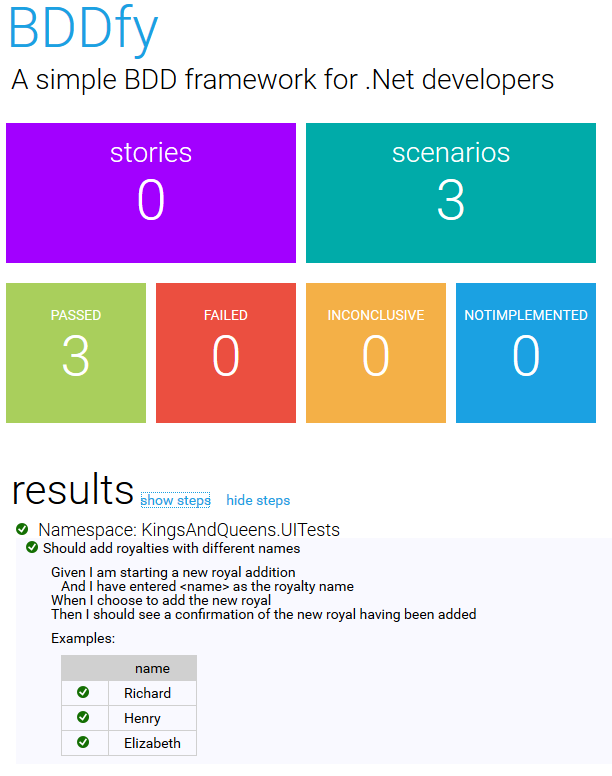 In this version, AutoFixture’s Build method is being used to automatically generate test data for all the fields, except the royal name which is set to the name(s) specified in the BDDfy examples. In a previous article I wrote about creating server side SignalR timer events. As part of my learning of SignalR I wanted to see how easy it would be to create a Universal Windows app consuming these server side events. I also added similar XAML in the Windows Phone 8.1 main page. 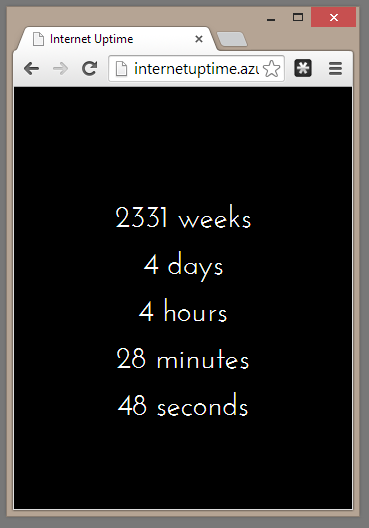 I thought it would be fun to create an “Internet uptime” page that you can see live here on Azure Websites. It shows how long the Internet (since ARPANET) has been around for. The HostingEnvironment.RegisterObject method can be used to register an instance of an object that has its lifetime managed by the hosting environment. To register an object it must implement the IRegisteredObject interface. This interface defines a Stop method which gets called when ASP.NET needs to shutdown the app domain. Next we create a SignalR hub and the HTML. The following shows the complete HTML for the page. Notice the “hub.client.internetUpTime = function (time) …” this function will get executed every time our server timer event fires. Sometimes when integration testing we need an HTTP endpoint. We can set one up in our solution (for example a Web Api project) and make sure it’s running before we execute our integration tests but it can be painful. Also consider when running on a build server, the web site will need to be provisioned, etc. For isolated integration tests that require some HTTP endpoint we can create an HTTP endpoint from within our test code that doesn’t require a separate web project. This means that when tests run they have no external dependency in the sense of a “real” website being hosted somewhere – even if that somewhere is on the local dev machine. Another advantage of the approach outlined below is that because it’s all in-process it’s also faster than actually going through the network stack. This code uses WebClient to call a web service. In the integration tests we want to spin up a website that will return a mock value for example. If we run this we get “System.Net.WebException Unable to connect to the remote server” as we’d expect as there’s no website at the address. First off, in the test project install a few of NuGets: Microsoft.AspNet.WebApi.OwinSelfHost and Microsoft.Owin.Testing. Here, regardless of what’s passed in we’re just returning a fake value. The test now passes, as our SUT connects to our in-memory test controller. Note: For even simpler code that doesn’t require a test controller we could also use Nancy. FluentMVCTesting facilitates the writing of tests against MVC controllers in a fluent way. It’s also not tied to a specific testing framework, so it can be used with NUnit, xUnit.net, MSTest, etc. The preceding test code is testing the ExampleController. It is testing that when the Show() action is called then the Orders view is rendered. The following code checks that an expected HTTP status is returned. To see more of what FluentMVCTesting can do check out my Building the Right Thing in .NET with TestStack Pluralsight course, check out the documentation, or check it out on GitHub. 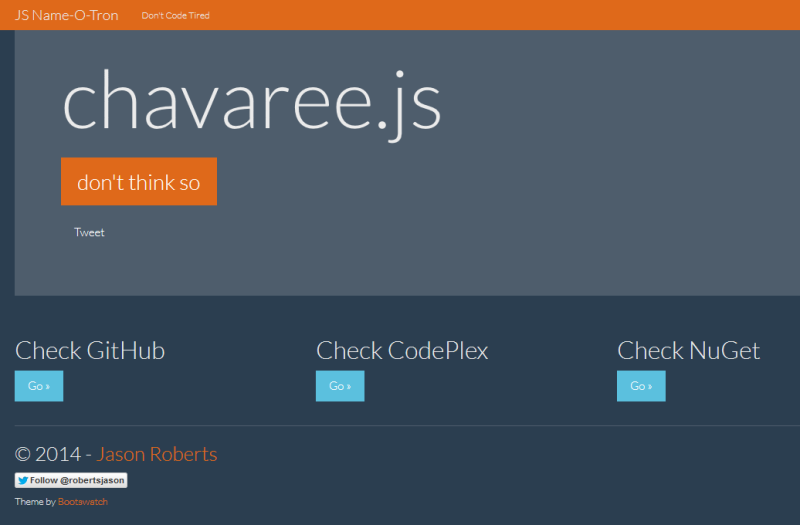 It generates a random word and adds “.js” to it – you can then check if there’s an existing library with that name (GitHub, CodePlex, and NuGet). I used Visual Studio 2013 to create a new ASP.Net application and chose MVC (v5) which resulted in a Bootstrapped site with a default Home controller and views. Sass (Syntactically Awesome Style Sheets) tries to make CSS fun again. It's a set of "extensions" on top of standard CSS that make it easier to write and maintain style sheets. A Sass file compiles down to regular CSS so it doesn't require any special browser plug-ins. This article is aimed at Microsoft developers but the Sass language sections apply to anyone wanting to get an overview of Sass, regardless of the web programming platform or IDE you're using.